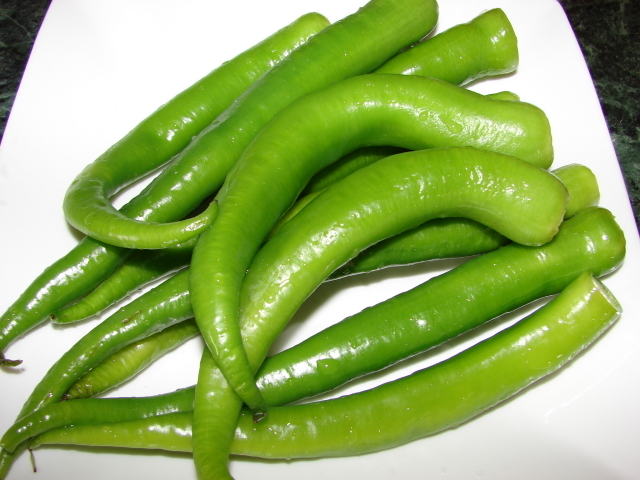 I was pleased to find some large green chillies from the market. I asked the store keeper if they are spicy he just shrugged his shoulders how helpful! In the end I bought a handful (just over 1/2 lb) to try in case they are not as nice as I thought. These chillies were quite long about 12 - 15cm long. I love Sichuan Hu pe jian jiao 虎皮尖椒 or stir fried blistered green chilli but it is not easy to find the right type of chillies. Here is my chance to try this recipe with these green chillies. The name of this dish is translated as tiger skin pointed chilli. Tiger skin here refers to the blistered or charred skin of chillies. For the recipe, remove the stalks. Cut a slit near the stalk, remove the white pith and shake off the seeds. I then cut the chillies into half. Heat the wok without any oil till very hot. 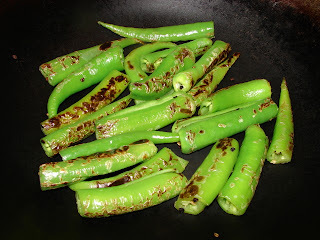 Throw in the chillies, stir fry till chillies are charred/blistered with black spots. Push the chillies to one side of the wok or pan, heat some oil and add about 1 heap tbsp of chopped garlic, stir till fragrant. 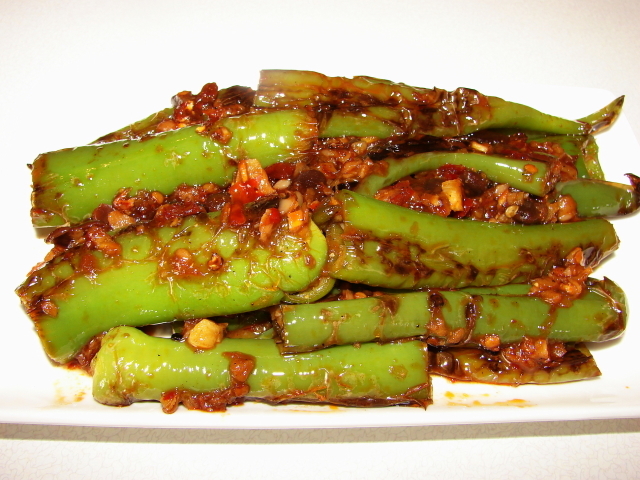 Add 1 rounded tsp yellow bean sauce and 2 - 3 tsp chilli bean paste (douban jiang), stir and mix with the chillies. Add a dash of cooking wine and sprinkling of ground Sichuan pepper. Add a little water, stir for a short while. Add some sugar to balance the flavour. Done. The green chillies were quite mild. Together with the chilli bean paste the completed dish was spicy enough for my taste. Tasty! note: If the green chillies are very spicy, sub chilli bean paste with yellow bean sauce or sweet bean sauce 甜麵醬. Taste the chillies before stir frying to select the right sauce. Ooh, nice. I've seen a few recipes for these before, but they didn't use any bean pastes/sauces, so I think I'll be trying yours instead! 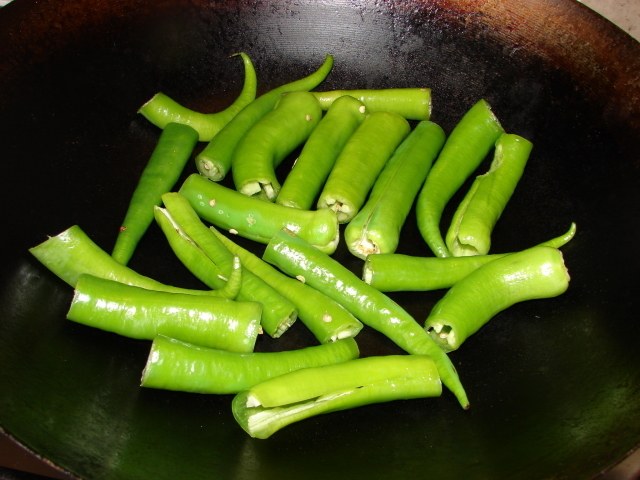 The white pith inside the chilies are nutritious and should not be removed. This looks good! There are many versions of this in Sichuan; I gotta try this one, but my old favorite uses garlic, fermented black beans, black vinegar with sugar, and no hua jiao.